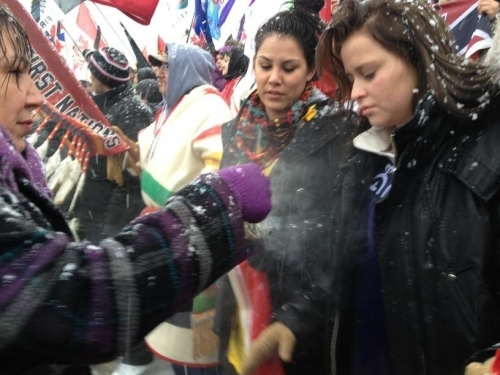 Thousands of Idle No More protesters are rallying in the snow in Ottawa to protest Bill C-45, which includes amendments that many First Nations say infringes on their rights. ""I travelled 3,000 km to be on these steps with these flags," one woman shouted according to Guardian reporter Isabeau Doucet, who was at the event. But with the world watching (support for Idle No More has come in from places such as The Ukraine, while the UK Guardian wrote one of the most definitive articles on the issue), the Harper government has so far shown little response. Minister of Aboriginal Affairs John Duncan has mostly brushed off the movement, saying "That's social media, so we'll have to see where that goes". His spokesperson said today that he has tried to reach Attawapiskat Chief Theresa Spence, who is 11 days into a hunger strike to meet the Prime Minister and discuss respect for historical treaties. Prime Minister Stephen Harper has given no acknowledgement of the Idle No More movement or of Chief Spence. His most recent tweets include no mention of First Nations, but of "Charlie the Chinchilla" and of the Prime Minister's Volunteer Awards. Pressure for action from the Prime Minister has been growing, with the Green Party and NDP leader Thomas Mulcair, as well as labour unions expressing support for the First Nations-led movement. The protests are largely around Bill C-45, the second omnibus bill which includes amendments to the Indian Act regarding voting and land designatins, but the bill is only one part of legislation that violates the United Declaration on the Rights of Indiginous peoples. In a recent speech at SFU, Chief Phil Lane Jr. pointed to a list of bills, ranging from Bill S-8, "Safe Drinking Water for First Nations" to Bill S-207, "An Act to Amend the Interpretation Act", which infringe on the rights of First Nations. "I'd like to thank our Prime Minister, Stephen Harper, for unifying us as no Prime Minister did before," he said. 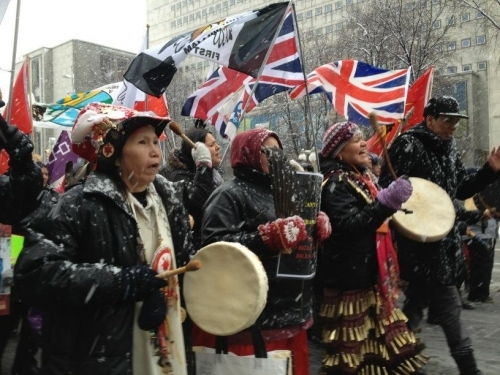 Mass rallies for Idle No More will be organized nationwide on Sunday, December 23. The Idle No More rally in Vancouver will take place at the Vancouver Art Gallery from 10 a.m. to 1 p.m. See the Facebook event page for details.